John Sweeney of Sweeney Legal is a will lawyer in Ridgefield, CT who recognizes the importance of planning one’s estate. Though you may be in good health and not yet at an advanced age, it’s never too soon to consider your loved ones’ futures after your passing. 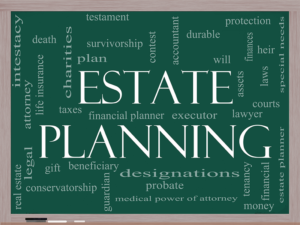 In fact, if you do not have an estate plan in place prior to your passing, it may be up to the Court to distribute your estate’s assets without any regard for your final wishes. Such a scenario can cause further grief and turmoil for your loved ones after you pass away. Creating a legally sound estate plan in advance of your final moments can offer you immediate relief and peace of mind with the knowledge that your legacy is secure. As a will lawyer in Ridgefield, CT, John Sweeney can be of great assistance to you with this. Below are the eight most common things people usually include in their estate plan. However, do keep in mind that your estate plan should be revisited and edited as needed about every three to five years or as life circumstances change. John Sweeney will be pleased to offer his legal services to you at that time, and if you have need for a will lawyer to make changes to an existing will, call him today. Creation of a Will: a list of beneficiaries who shall inherit your assets (property, monetary value, treasures, vehicles, etc.) after death. Your will lawyer in Ridgefield, CT can provide guidance as to which of your possessions you might want to include. Establish a Living Trust: writing a living trust can help prevent your loved ones from going through probate court in regards to your estate. A will lawyer in Ridgefield, CT such as John Sweeney of Sweeney Legal can explain the various types of living trusts, and which one might best suit your needs. Health Care Declarations: in the event you become incapacitated or disabled, these health care declarations include your preferences for medical care. Naming a Guardian: if your children are minors when you pass, this is someone who you choose to be their legal guardian. Appoint Power of Attorney (Financial): otherwise referred to as a durable power of attorney for finances, this is someone you appoint to take care of your finances if you become unable to handle them yourself. Communicate with Beneficiaries: consider being open with your beneficiaries about what is included in your estate plan, so they have an idea of what to expect down the line. Your will lawyer in Ridgefield, CT can offer you additional tips not included here. Organize Key Documents: the person you appoint as will executor may need to have access to the most important documents regarding your estate (including will, trust, deeds, stocks, insurance policies, retirement plans, credit cards, unpaid taxes and any other documents with final instructions). Be sure they will have access to this information when the time arrives. Consider Funeral Expenses: you can create a payable upon death account with your bank, into which you can deposit funds into to pay for your funeral expenses. John Sweeney of Sweeney Legal is a will lawyer who has dedicated himself to providing legal services to his community of Ridgefield, CT. Contact him today to learn more about how he can help you preserve your legacy and ensure that your final wishes are followed by those you leave behind. Having a conversation with your loved ones regarding creating their estate plan can be incredibly difficult. Most children don’t want to appear as though they are pushing their parent to create a will so that they may profit. Set up a time with your parent to have this conversation in as mindful of a way as possible. If you have siblings, it will be a good idea to include them in part of the discussion. You will want to make sure that their voice is also captured. Take the time to listen to your parents’ needs. Ask them questions, and attempt to understand why they may be resistant. In many cases, you may find that you are able to clear things up with them (perhaps even with the help of an estate planning attorney in Ridgefield, CT) and help them ease into the process. Most people don’t want to leave their loved ones to sort through a person’s affairs without a roadmap. Without a will, you may be left to pick up the pieces and decipher what your parent’s final wishes may have been. They may not have realized the impact this could have on you and your siblings. In addition to prolonging the process, decisions are taken out of their hands and loved ones stand to face tensions with one another as they compete for their own interests. An attorney may be able to help assure a person of the ease in which they can approach the process. Many people who believe they do not need a will may have a change of heart after speaking with an attorney. Sometimes, it can take the counsel of an experienced attorney to be able to help people in coming to the most informed decision possible. Although this may be difficult to hear, it’s important to know that you cannot force your parent to create their will. Sometimes, you may have no other option than to accept that your elderly parent is entitled to their decisions, even if they could be damaging. The thought of putting together a will can feel completely overwhelming. The reality is that the process does not need to be as daunting as many have been led to believe. Working with an experienced estate planning attorney in Ridgefield, CT can help to put your mind at ease by mapping out the process and ensuring that nothing is left out of your will. Every day, will lawyers hear terrible stories about how a client’s loved one was taken advantage of by some unscrupulous person. A common scenario usually involves an elderly person who was being helped by a home health aide for a few years and then passes away. When their will is read, their family discovers that no one in the family is receiving any part of the person’s estate as they had been told in the past. Instead, a new will was executed that leaves everything to the home health aide. At Sweeney Legal, LLC, we are here to help you and your family should you find yourself victims of suspected will fraud. Contact our office today to meet with one of our Ridgefield, CT will lawyers and find out how we can help. Any time you think that a will does not really reflect what your loved one’s last wishes, you should contact an estate litigation attorney to contest the will. When you contest, you are requesting the court to declare the will invalid. There are several reasons why a judge may declare a will invalid. One of those reasons is if the evidence shows that the decedent was unduly influenced by someone when the will was being executed. In the above scenario, a will lawyer would present evidence to the court that would show the type of influence or manipulation the home health care aide may have used to get the elderly person to change their will and leave all the assets to the aide instead of family members. There may also be evidence that the decedent suffered from some type of condition that would have prohibited them from having the mental capacity to create the changes in the will, such as Alzheimer’s disease or dementia. The will can also be contested if it is suspected that it was forged and it was not signed by the decedent. The same rules apply if the will was altered in some way without the decedent’s consent. Another reason why a will can be declared invalid is if the decedent signed the will but did not know what the actual instructions were – in this scenario, distributing all assets to the healthcare aide and not family members. A will lawyer in Ridgefield, CT will carefully evaluate your case and gather all pertinent evidence and witness testimony to determine what grounds will apply in your situation. In order to be successful at contesting a will, you need a skilled and experienced will lawyer. If you believe that your loved one’s will does not reflect their last wishes, the legal team at Sweeney Legal, LLC can help you determine if the will is able to be contested and on what grounds. We will then work diligently to get you the best outcome based on the circumstances of your case. FAQ: Can I Name a Beneficiary without a Formal Will? The process of creating a will can be understandably intimidating. Few adults desire to spend much time at all thinking about what the world will be like once they have passed away. This is a normal reaction to the reality that life is short. However, it is critically important to take a brief amount of time in order to formalize your wishes with the help of a trusted estate litigation attorney in Ridgefield, CT so that when you are gone, your property is respected and ownership of that property is passed along in ways that honor your preferences. If you have yet to create a legally enforceable will, please consider scheduling a consultation with an estate litigation attorney Ridgefield, CT relies on from Sweeney Legal, LLC today. Our firm has extensive experience helping individuals and families plan for the future in this way. We pride ourselves on an approach that is sensitive and efficient, so that our clients feel confident in their estate plans but do not feel overwhelmed by a process that is time-intensive or unnecessarily expensive. Failure to invest a bit of time, energy and courage in this process now could lead to negative consequences for you, your family and your property later on. Please consider allowing a trusted Ridgefield, Connecticut estate litigation attorney help you make a sound, legally enforceable will. There are certain circumstances under which you may be able to name beneficiaries for some of your assets outside of your formalized will. For example, if your employer provides you with accidental death insurance, you may be asked to name beneficiaries for the policy when it is first executed. However, all other personal property of sentimental and/or monetary value should be passed down by formally naming your beneficiaries in your estate plan. Unless you plan to create a trust or trusts in addition to your will, beneficiaries are generally named within the body of the will itself. It is important to have an estate litigation attorney in Ridgefield, CT help you draft and formalize your will so that it is legally enforceable. Without this step, your loved ones may challenge your wishes or have their property interests impacted unnecessarily by the process of probate. Formalizing your wishes now may save your loved ones a great deal of trouble later on. If you have questions about creating a will specifically or naming beneficiaries more generally, please consider scheduling a consultation with an estate planning attorney Ridgefield, CT relies on today. Once we learn more about your financial situation, your needs and your priorities, we will be able to advise you of your options and provide you with necessary guidance and support. Naming beneficiaries is a serious business, because it helps to ensure that individuals can protect their loved ones after they have gone. In addition, ensuring that beneficiary designations are enforceable is critically important when trying to safeguard an individual’s wishes. Our firm is dedicated to helping individuals and families prepare for the future in sound, legally enforceable ways. Please consider scheduling a consultation with a estate litigation attorney in Ridgefield, CT trusts in order to receive the guidance and support that is necessary in order to achieve that end. How long will it take to create an estate plan? What is your experience in working with estates? Do you provide a program that offers services to update and maintain my estate plan? Is there a fixed price for your services? The first meeting can feel overwhelming, creating an estate plan can seem like a huge project. However, with our help, it doesn’t have to be. This information should be provided for family members like spouses, children, and stepchildren. Even if you do not plan on leaving an inheritance to someone, it’s still good to provide us with their information. It will also be important that you share information with your extended family and the role you intend for them to play in your estate plan. Come prepared with details surrounding any properties you own. This should include joint tenancy information, mortgage balances, and market values. Begin taking inventory of your personal property. It will be important to include this within your estate plan. Even if something isn’t valuable in a financial sense, things like family heirlooms may be of particular importance to your family. Taking stock of things like jewelry, antiques, family heirlooms, art, and collectibles is important so that you are able to identify who stands to inherit them. Although it can seem like a lot, preparing the necessary information in advance can save a significant amount of time. When faced with the unexpected or as you face the natural progression of aging, Sweeney Legalcan help you develop your estate plan quickly. Contact one of our estate planning attorneys in Ridgefield, CT today to schedule your first appointment with us. Call our firm today to set up a free and confidential case evaluation with a will lawyer Ridgefield, CT clients recommend and find out how we can help.